When God created "outsourcing", she/he/it clearly had a sense of humor. I mean, how do you encourage people who offloaded a chunk of their low-end processes offshore to get together and form an "industry"? Sure, you can pull together those providers and consultants who've made a fortune orchestrating the "offloading" to get together and feel good about what they do (or at least convince themselves they should feel good about it) but the reality is, outsourcing "networks" are strange concoctions of individuals striving to feel part of a "community" that doesn't really exist. Let's cut to the chase here - "outsourcing", for most buyers, is like purchasing a wedding dress - a one-time transaction followed by seven years of relationship struggles and future legal wrangles. I mean, when was the last time the missus went to a wedding dress convention? In this context, how can you encourage buyers to get together to spend days-on-end reliving that one-time purchasing experience with the fervor of a civil war battle re-enactment? 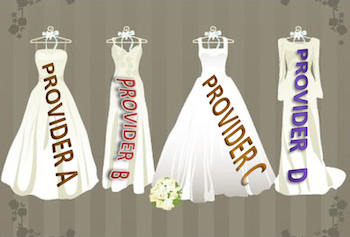 Do service providers really think they are going to meet hordes of "outsourcing buyers" in wedding-dress selection mode when they splurge forty grand sponsoring the room keys at some event? Of course they don't - they just like the fantasy that if they flash their brand everywhere, something positive will happen. What's broken here is the fact that "outsourcing" is broken terminology and isn't a real industry. Most of tomorrow's deals are not going to involve major staff transitions from buyer to provider as part of the deal - today those engagements are on the wane as most of the bloated buyers have been progressively trimming their fat in recent years. Moreover, most of the providers today have the capacity they need to service their clients and will only entertain major "lifts and shifts" of employees if these deals are strategic to their growth ambitions, and involve the transition of both domain expertise and technology assets. Isn't today's "outsourcing" really "expertise augmentation"? If your firm decides to select a new marketing agency, you don't automatically declare "we outsourced marketing". Instead, you make the point that your firm is augmenting its expertise in marketing. Noone alludes to the fact that your firm may have discretely offloaded a few marketing staff in the process, as they weren't relevant with many of today's marketing demands, such as advanced analytics and social business strategy. Exactly the same applies with processes such as procurement, finance, claims management, software development etc. Most firms rarely transition out more than a quarter of their functions in an outsourcing engagement, they are simply increasing their focus on being relevant with today's needs. At HfS, we are proud to boast a vast array of networks which actually total 130,000 individuals - but you can hardly classify the commonality across these people as "outsourcing" - that is just one component of many, which constitutes the orchestration of global operations. We have broad groups of shared services specialists, outsourcing governance pros, finance and procurement executives, business analysts, customer services managers, IT leaders, systems architects and functional heads etc. We have clusters of Big-5 consultants who focus on anything from outsourcing to tax advice and service providers who'd do anything to remove the term "outsourcing" from the Oxford English and Webster dictionaries. The Bottom-line: Are you an outsourcing pro, or a global business pro? So isn't it high-time we stopped convincing ourselves there really is an outsourcing industry? If you base your entire career living in a perpetual outsourcing transaction-cycle involving hordes of staff transfers and staff re-badging, then, fair enough - YOU REALLY ARE AN OUTSOURCING PROFESSIONAL. However, if you want to focus your career on improving processes, finding new and creative ways to improve companies' productivity and growth, and leverage today's availability of global talent into the bargain, aren't you probably what we are calling a GLOBAL BUSINESS SERVICES PRO? Interesting point but I would characterize a new venture, developing from rapid service delivery offerings to what we have to day a sham. What I would argue is that this is an industry but one that is in those stages whereby formality is not only be established but also one in which new provider side capabilities are being build. If you blame the results of a failed marriage on the part of the other then you aren't taking a hard enough look at yourself in terms of your culpability. It took some guts to publish these views publicly, but WELL SAID! That explains why, when people ask me what I do, I have taken to say "I help companies globalize." Just hadn't thought it through in such an elegant manner. Your thoughts here are so true. "Outsourcing" is completely misused and overused today, and also has a bad rep with clients, as it is always associated with staff retrenches and offshoring. Instead, we should use "globalshoring" more, as this is a common practice across many company functions, and the "globalisation of processes and business operations", which is the real goal of firms which have combined multiple delivery frameworks, which almost always included shared services, BPO, ITO and inhouse. It's time to put the Outsourcing phrase to bed for good! I agree with Amanda's suggestions here. Globalshoring and globalization of business operations are great suggestions. Outsourcing must go! Phil: In the analytics and research industry (or KPO as some would still like to call it), your assertion about "expertise augmentation" is absolutely true. I encounter so many 'KPO' companies who want to be everything for every vertical. Although there is growth in these process outsourcing deals, most analytics & research engagements have moved towards best use of global domain expertise (rather than outsourcing a non-critical function). This little semantic exercise does little to address the "minor" problem of the destruction of the US and other Western economies from one that is vibrantly balanced between supply and demand to one that is predominantly driven by consumption. When I was a kid I used to accompany my dad, a single store garment retailer, on his buying trips to New York City (where the factories and garment district were). Later in his life, he took those same trips to the Carolinas and finally to Florida. Today, you know where he'd have to go. Let's just say he couldn't drive there. I don't find this useful or particularly cute. And even as I advise my clients how to manage their outsourced production quality and processes I remain aware that I have become part of an industry that is short-sighted and living in denial. In chasing cheap labor, we have a created a fundamentally unsustainable economic model. That wedding dress added no real economic value to the bride and her family. It gave her a one day rush...just like "globalsourcing" is giving us a very short-term rush. And the marriage itself is not much better. Long time since I ventured onto your site and the topic was too close to heart to ignore it :) Thank you for spelling it out. I said this years ago and everyone laughed and made jokes on how arrogant I was to say so (most of what happens in the industry is a sham). I was actively in the industry and it always made me wonder if anyone was actually providing any "value" apart from the "cheapness" factor while people lost jobs in droves - in the name of "Globalization" :) My apologies Amanda but seriously "Globalshoring"???? Thank you for saying it aloud. What an industry and what an experience! I have a narrower focus around supply chain management and would really like you take on outsourcing of this function. Unlike the outsourcing of, say, some aspect of Marketing, there is a permanent transfer of physical assets to the outsourcer, and many large companies such as Flextronics and Jabil, amongst others, have built a business around this activity, which theyc all contract manufacturing. What has caught a lot of the OEM's by surprise is the extent to which they still need 'control' over the extended supply chain because ultimately they are still responsible for satisfying customer demand. In other words the supply chain expertise is what they have not been able to outsource,e ven though they may have outsourced the physical supply chain. Indeed outsourcing was a relevant characterization of a particular form of organizational transformation whose prominence has dropped. Indeed after decades,"trimming" for many is a euphemism. To take your point further, one could likewise question the term of "services". What signal to noise does that bring ? It does indicate that the "expertise" is provided commercially rather than in-house, so it has its use. So the proposal of GLOBAL BUSINESS SERVICES PRO really indicates the clientele. That makes for a good focused trade show of things that global businesses buy. However if people are to categorize what they do, "services" is as about as descriptive as Colin Clark's service sector, covering everything from janitor to judicial. Service industry is a bit of an oxymoron when you know that - quite often - the former serves the latter. As said Bertrand Russel, "Work is of two kinds: first, altering the position of matter at or near the earth's surface relatively to other such matter; second, telling other people to do so." Thanks for excellent point and the very nice breeze of fresh air. Spring cleaning ? Absolutely correct. Time to blow up the current lexicon and false value construct of the make-work sourcing industry as we know it and build something entirely new that adds real value, expertise, and efficiency not just to the buyer/corp side of the equation but to the entire system, which includes labor and society. @Paula: Thank you for your thoughtful response. I believe we are on the cusp of a new direction with this industry. At one end of the spectrum, there's no point trying to compete with the 500,000 $1/hour Chinese workers churning out Apple products. However, the last decade of low-cost arbitrage of white collar jobs cannot be sustained with a labor-only model. You can now take on a lot of finance, procurement, HR, insurance, banking etc. process work that is delvered onshore and isn't a whole lot more expensive than going to some offshore locations. There are many smaller providers rolling up with onshore facilities right across the US, and all the major providers have invested in varying degrees of onshore delivery. The new "battleground" for global jobs is with many of the middle-office functions, such as analytics, research, customer management etc where the cost differentials between US employees and offshore/nearshore employees almost negligable in some cases. I believe the US can still be competitive in developing its onshore business services industry. The crux of my argument here is that this isn't really "outsourcing" anymore. I always judged the old-world outsourcing as lift-shift wage arbitrage. The changing nature of deals is much more geared towards "expertise augmentation" and business services. Calling it "outsourcing" doesn't make a lot of sense anymore, only inflames prejudices and job insecurities. Moreover, there really isn't a true network of "outsourcing" buyers today: outsourcing has simply been one vehicle to augment organizations' global delivery frameworks. You only need to look under the covers to realize that, while most large enterprises outsource some IT/business processes, it's only a small fraction of their overall operations (we'll be releasing some new data here ver soon to support this). Providers in general sell what buyers ask for. I'm sorry to say that most buyers are poorly advised so they buy what they think they want missing out on the potential value that exists. The BPO industry is the new process consulting model in my mind. The top BPO players have more expertise, make the biggest investments and have the greatest level of industrialization. Buyers should seek to leverage all those things to their advantage. Labour arbitrage still exists. It is declining slowly but is being replaced by capability and skills leverage. Lift and shift players will soon become extinct even if they do have onshore centers and hire lots of onshore salesmen. The industry needs to shift up a gear and start focussing on value creation. Improving the performance of our clients. @Peter Livaudais (and many others commenting here): "Things that global business buy". I like it! Let’s face some home-truths here – “outsourcing” as it exists today really is labor arbitrage for most of the lower value work in IT, F&A, Procurement, CRM etc. The common thread among buyers is more how to manage LABOR ARBRITRAGE effectively, than anything else. So why doesn’t that industry call itself the “labor arbitrage industry” and focus itself on how to improve processes once part (or all) of them have been moved offshore – essentially, “we’ve done our lift and shift, now let’s see how we can make it better, as opposed to running the same crap for less”. However, when we get into the new generation of process-externalization engagements, the focus is on a broader range of processes where – in many cases – labor arbitrage isn’t really possible. For example, with pharmacovigilance, the chances are the “buyers” need added help with compliance and quality measures that they simply do not have, and there really aren’t any staff that can be laid off to offset the cost of the incremental services. Moreover, even with more commonly-used hozontal processes such as procurement and HR, most “buyers” don’t have excess fat to burn – they have alreay trimmed their inhouse teams to the bone (i.e. many firms have one HR rep to as many as 200 staff). They need new services and help, not a replacment of inhouse labor. So “outsourcing” as we call it today, really is a component of function, not a function in itself. It is a means to an end, often not the end itself. It’s not dissimilar from Cloud computing, except it’s about externalizing expertise, not IT infrastructure. Regardless of business function, Cloud has relevance as an enabler to achieve better things – and it’s the same for “outsourcing”. I would prefer to see us creating broader communities around business objectives and have process-externalization / expertise augmentation as a key part of each discussion. For example, you can’t go to a conference focused on improving global finance operations, without discussing shared services and offshoring / BPO. However, the core focus of that network is about achieving more productive, relevant and global finance, where senior people can have rational and objective-led discussions on global operating models that can take better advantage of global talent and technology. The key is to bring the global services discussion to the real business table, and not create some oddball table of offshoring experts who are alienating themselves by creating their own little siloed network. The more the “outsourcing” industry (as we have been calling it) remains in its silo, the harder it’s ever going to be to have the global business model discussion with the real business function leaders. We agree with the notion that “outsourcing” is broken terminology. The term is often misinterpreted and confused with “offshoring,” which creates an instant dark cloud of pessimism. However, we associate outsourcing with increased opportunities. As an outsourcer, we act as consultants who relieve time-consuming and inefficient tasks from agencies and advertisers, so they can focus on more strategic work that helps them accomplish more. What is in a name ? I guess for America now politically it is a bad word. Whether we like it or not "outsourcing" Is here to stay. I agree business process improvement - speed, accuracy, scale and price performance is the name of the game. Phil & all the contributors, this is one of the very best discussions on what is not, has never been and never will be an industry! I have personally been involved in that "thing" for 20 years now and in many capacities, on all sides. Lift and shift and labor arbitrage are only activities and both are running out of runway which is a good thing although (and this was not mentioned I believe) while jobs and wealth has been exported one should not negate the fact that if low US jobs have disappeared the growth of India and China is a wonderful thing. Macroeconomics work and over the long run salaries MUST even out and they will unless government cheat, playing with currencies or a variety of artificial barriers. Right now those barriers are going up due to the self-generated economic crisis in America and most of Europe. On the flip side, look at Brazil or Africa, look at the GDP per capita of China and see how much has been accomplished and how much room still remains for wealth sharing. Putting the above aside I am regularly astounded by the lack of maturity of buyers and sellers of what we call "managed services". Price will always be a dimension but scale, expertise, innovation, variability, trust etc.. will continue to drive decisions as to what a firm believes it can and should retain and what can be contracted from outside. To some extent this balance is cultural but it is influenced by tax, labor laws, labor markets and changing economic circumstances and even technology. Just to give an example, "cloud" which is just a logo really is forcing senior business executives to challenge their IT departments and the point is not whether the "cloud" is internal or externalised.. it is what you do with new virtualisation tools and the procurement of flexible solutions and various price/service/security levels. That is a managerial decision and it certainly should NEVER be outsourced! When we advise clients marriage, what it really means and entails is the point of discussion.. not the brand of the wedding dress! Being realistic, I think labor arbitrage is just symptoms of something else. The real problem is that it costs significantly less to raise, educate and feed a person of equal ability and willingness in a country like China or India, than in a developed country. The cost of living is much lower as well. But, as human work can now be delivered remotely (be it the next building , or at the other end of the world), then you'll see more "produced" in the lower cost locations. Does this means unemployment in the higher cost country? Not necessarily, and in IT, where most leaders are US based, this hasn't happened yet. But it does mean you are now in an industry where your local talent have the cost disadvantage, and much higher uncertainty in your working population as well. The erosion of salary arbitration will only accelerate if and when the costs of proper education and the cost of living levels. I can say without a doubt that a vast majority of the people working in global services from lower cost locations may likely prefer to live in the USA or Europe if given a choice. Great talent seeks a better employer and a higher paying economy. But most won't get a chance to do so, and it would also be unfair for those becoming educated in the US. Else, the next innovation would be "offshore education": just travel to India for university and save some $200,000 on the way. The value proposition for outsourcing must come from process, IP and business best practices. This can be combined, but has little to do with salary arbitration itself, a rising-star "category" in global commodity trading. This is irrespective of where the job is done. But if you have a process advantage, why would you not leverage salary arbitration as well? Would Apple be best suited manufacturing in USA, because they could afford to absorb much lower margins? Or, just like Coca Cola sources supplies from anywhere in the world (say essential oils, or grape Juice), and then sells globally, so do innovators in service delivery. So even for companies that can "compete" with India, there's no incentive to stop there. If you don't do it, somebody else will, and catch up with you. A market-oriented private sector is loyal to customers and shareholders only. Since the customer base is global, and since shareholders do not need to be employed, they cannot do much about all this. So maybe it's about time to consider tax free zones for global talent, plus some break-through innovations in education that are kept as national trade secret? I really don't have the answer. Taxing lower cost locations will only temporary alleviate the problem, while creating roadblocks for shareholder to sell globally and making the government a larger elephant. Implications of this are that, in a high cost location, a hairdresser may end up being a safer career path than IT. Hairdressers have extremely less competition than programmers, IT experts, or BPO specialist. In a labor intensive industry, it's hard to have talent that is systematically 3x as productive as the newest lowest cost location. If the advantage is in IP, process or business knowledge, it will still be offshored unless the cost difference makes it not worth the hassle. Your post is a dual call for action. Formally a substitution of terms and a reality check. Substantively the abandon of what economists call “a market of lemons”. Deming in his 1982 “Out of the Crisis” called for no less, his aim was the “transformation of the American style of management” and he states on the first page of his introduction that “it is no longer socially acceptable to dump employees on the heap of unemployed”. However this has been going on since the chimney chasing of the 1930's, as Paula noted. One of the major difficulties is that even “GLOBAL SERVICES” providers have the propensity to piecemeal their services mapped to the organizational structures of their clients. First it is easier to pitch an identified and localized activity, a “quick-fix”. Secondly contracting parties, more often than not, are in a state of asymmetrical knowledge (or lack thereof) with respect to their counterpart's true businesses. In summary there are many vested interests in the “silo” or “component” approach that you mention, not to speak of control (or loss thereof). If the term “adding value” is to mean anything else than “slashing costs” then there is indeed a need for transversal thinking, and that is what is supposed to happen “up stairs” on the condition that there isn't a divorce from “down stairs” internal or not (to continue with your metaphor of marriage, and to take from Grove's “Only the paranoid survive” percolation). Is there enough trust for transparency ? With respect to labor costs as a competitive advantage : Leontief's paradox and tough questions for all. Clients and suppliers alike. @Vinnie: Your examples are excellent and I highly recommend everyone reads your new book. However, we are not debating the pros and cons of outsourcing itself here, we are highlighting what the industry needs to do to become more relevant to the real business decision makers (i.e. less wedding-dress and more marriage). People like you, highlighting to the mainstream business audiences how externalizing certain business functions can add value and growth to companies, are doing the "outsourcing" industry a wonderful favor. Phil, trust me - I see the outsourcing market as a big ocean of mediocre to bland product. The industry needs to reinvent in a big way. My examples above are by definition stand out to be part of a book titled The New Technology Elite. Good points. Outsourcing is another form of horizontal specialization and vertical disintegration. I specialize in designing products. You specialize in doing my accounting. Or vice versa. It's been going on since the day after Henry Ford opened River Rouge and maximized the model of vertical integration. Couldn't agree more with the central point of this article. Sure, lift-and-shift and labor arbitrage are played out. But as a professional based in China, I can't help but notice there's a complimentary, but no less salient, trend afoot: the ascendance of multinationals originating from beyond the traditional US/Western Europe nexus of power. Global business services seems seems as good a name as any to describe this industry, a substantial part of which will make its living for the next 10 years helping emerging companies mature more rapidly than their Western predecessors managed to. Without labor arbitrage to lean on, success in these markets will certainly demand a more sophisticated set of competencies from provider organizations. Though for us professionals, I'm suspect it will still come down to continual remastery of the holy trinity of People, Process and Technology.